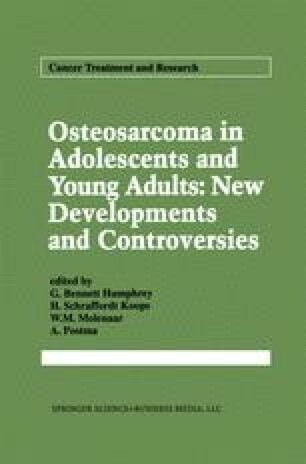 Histologic subclassification of osteosarcoma, with the exception of parosteal osteosarcoma [1, 2, 3], has not been regarded to be useful as a prognostic parameter. Nevertheless, it is now applied in routine surgical pathology. A generally accepted subclassification is the one by Dahlin and Unni of the Mayo Clinic [4,5] (Table16-1). Our experience is shown in Table 16-2. MFH-mimicking osteosarcoma, giant-cell-rich osteosarcoma, and dedifferentiation of intraosseous well-differentiated osteosarcoma are added.